Pontypandy needs help; and Fireman Sam is on hand to save the day! 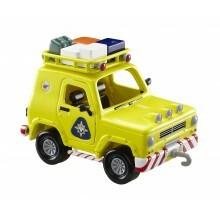 This vehicle and accessory sets includes Jupiter the Fire Engine. Each vehicle is in scale with the figures and playsets. Each have accessories, moving parts, sound FX and phrases from the show and can be pushed along! 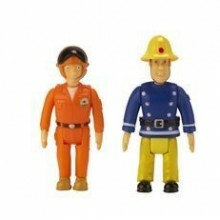 Pontypandy needs help; and Fireman Sam is on hand to save the day! 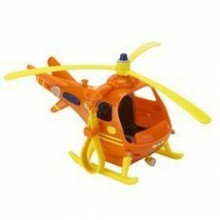 This vehicle and accessory sets include the Rescue Helicopter. Each vehicle is in scale with the figures and playsets. Each have accessories, moving parts, sound FX and phrases from the show and can be pushed along! Create the village of Pontypandy in your own living room! 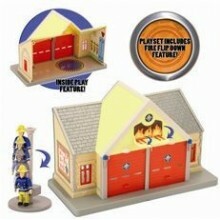 This Fireman Sam Playset and figures includes Elvis in the Fire station. The buildings have a flip down feature to reveal a fire for Sam to put out, and are in scale with the vehicles.Each mini playset includes accessories for all of your fire fighting adventures!